While it was a good day for a walk, it was an even better day to walk and help raise funds for the MS Society of Canada. The annual walk, which takes place across the country, raises funds in support of Multiple Sclerosis research and support for those who have the disease. The Mandarin MS Walk, named for the main sponsor, took place locally on Sunday, May 6, in support of the Dufferin Peel chapter which includes Orangeville. Around 100 people registered for the walk, a 5 kilometre route that started at Montgomery Village Public School in the west end of town. Local businesses chipped in to support the event and contributed to keep people fed before and after the walk. Orangeville Starbucks and Son of a Chef Bakery provided the breakfast. Pizzaville, a national sponsor, and M&M Meats provided pizza and hotdogs and hamburgers for lunch. Multiple Sclerosis is a disease that affects a lot of Canadians, In fact Canada has the highest rate of MS in the world, yet no one knows why. Currently there is no cure or known cause, however some of the funds raised go to research to determine the cause and prevention. The local walk was quite a success, bringing in $9,752 on the day of the walk. Online donations had brought in $38,497 leading up to the walk day. They hope to break the $50,000 mark as people can still contribute online through to the end of the month. 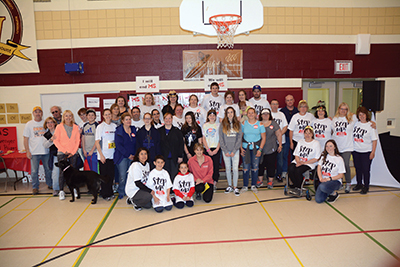 The MS walk in Caledon raised $26,679.